Delivered with separate 9 piece etched glass pack with starburst corners. Also available as an un-glazed door. Victorian Oak Downham Glazed Internal Door. A classy traditional door with a whole lot of Victorian style. Also known as a Vestibule Door. The Vestibule was a closet where ‘callers’ would leave their coats. This is a classically-styled, internal door typical of the Victorian and Georgian eras. It is a glazed internal door for most living areas of the home such as kitchen, dining room, living room, hallway and snug areas. For added light transfer between rooms the Oak Downham has etched glazed panels above two lower smaller rectangular timber panels. This Downham door swaps the top 2 timber panels for a 9 pane frosted glass unit with blue feature glass in the corners in a star design. The 9-piece glass pack is packed and shipped separately to the door. So ready for installation by handy DIY-ers or a local joiner. The beading and panel pins come with the door. It has toughened glass so if anything untoward should occur it will crumble into granular chunks. 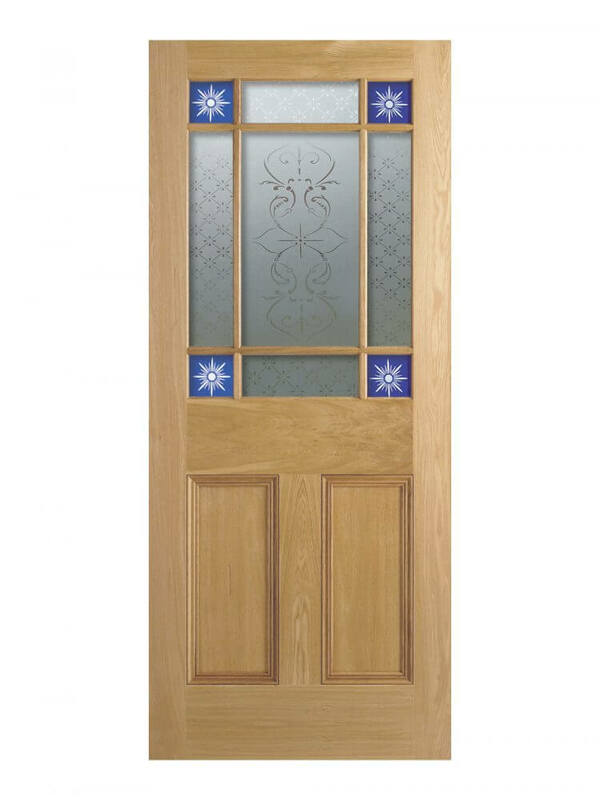 This oak veneered door is also available as an unglazed version which is supplied with the necessary beading for your own glazing project. 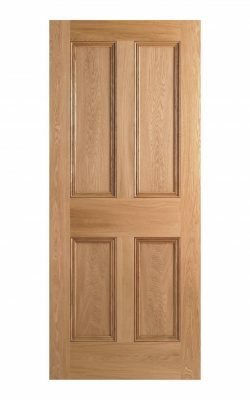 The partner solid door is the Victorian Oak Four Panel Internal Door which is also available as an FD30 Fire Door. A glazed door for all locations; dining room, living room, kitchen. Traditionally, bathrooms were also fitted with these beautiful doors, with the addition of curtains. Again, the classic, flourished design offers a rich style to both period and contemporary designer interiors. With a distinctive Victorian look. In this way the panels are flat and the edge down to each panel has a deluxe moulded beading. Engineered doors are very stable and are designed to limit warping, splitting and small changes in size with the seasons. Un-finished it comes in readiness for your own choice of topcoats. An unfinished, engineered door which is ready for your choice of final decoration . It has an engineered, solid core (weight up to 23kg). Also with a layer of 10 mm lippings all round. The whole is then covered with A-grade white oak veneer. You can make adjustments on all sides up to 6mm. So making it a perfect fit for new and existing door frames. Your new door comes with a manufacturer’s 10-year warranty. This model is also available as an un-glazed door. We can supply hinges, door handles, frames and intumescent strips separately for the installation of your Victorian Oak Downham Glazed Internal Door. We recommend a minimum of three hinges for this door. Seek specialist advice on which areas might require fire doors. Also, your architect or local building control officer will offer advice. Always have your doors installed by a professional joiner. Please note the glass pack is shipped separately. Please see further guidance and installation information in our Blog section.